The Wonderful Wizard of Oz is one of the biggest and best-loved stories in children’s literature. Brilliantly vivid and breathlessly exciting, The Wonderful Wizard of Oz follows the journey of Dorothy and her little dog Toto as they are transported from grey Kansas to the curious and colourful land of Oz. 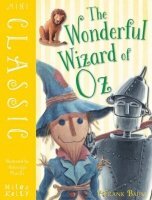 She is joined by the Scarecrow, the Tin Woodman and the Cowardly Lion, and they set out on an adventure that twists and turns along the yellow brick road. L Frank Baum was born on 15 May, 1856, in New York state, USA, Lyman Frank Baum was the seventh of nine children. His father owned a barrel factory, so the family were well off. Baum was an imaginative child. He started writing as a teenager, when he became fascinated by printing. He also loved the theatre and at 24 he founded a drama company, for which he wrote several plays.